Waterton Lakes National Park is mostly a summer destination, with most hotels and services closing between November and April. Summer (July and August) is definitely high season. Simply said, the weather is unbeatable. The season is dominated by long, warm–and sometimes hot–days, everything is open, and there’s plenty to do and see. Crowds, higher lodging prices, and difficulty securing hotel and camping reservations are the downside of summer travel to Waterton. 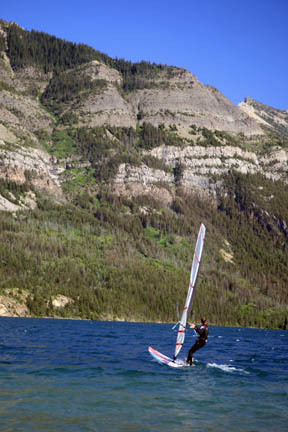 Waterton is renowned by windsurfers for its constant winds. Late spring and early fall are excellent times to visit Waterton Lakes National Park for two reasons: you’ll avoid the crowds, and you’ll save money. Spring (mid-Apr. to late June) is notable for long days of sunlight (in late June it stays light until after 10 p.m.) and a sense of optimism for the upcoming warm months. Be aware, however, that many of the park’s best sights and hiking trails lie at high elevations; some areas may be snowed in until late June. Fall (mid-Sept. to Nov.) can be delightful, especially September, with lingering warm temperatures and a noticeable decrease in crowds immediately after the long weekend (at the beginning of the month). While fall colors in general lack the intensity of those in the eastern provinces and New England, aspen scattered through the valley turn a brilliant yellow throughout high alpine areas in late September. The weather in Waterton plays an active role in creating the park’s natural landscape. This corner of the province tends to receive more rain, snow, and wind–much more wind–than other parts of the Canadian Rockies. Wind is the most powerful presence in the park. Prevailing winds from the south and west bring Pacific weather over the divide, creating a climate similar to that experienced farther west. These warm fronts endow the region with chinooks–dry winds that can raise temperatures in the park by up to 40°C (104°F) in 24 hours.